Welcome to the 4th part of this course. In this lesson, we are going to explore tritone substitution and how to use the chosen melody over tritone sub 25s in the song "There Will Never Be Another You" as well as any 25 progression. You should already be familiar with the concept of tritone substitution. 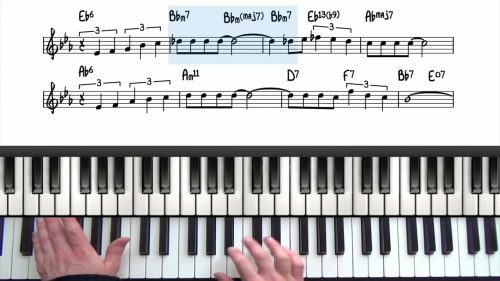 Check out the PianoGroove course on "Chord Substitution & Reharmonisation" if this area is new to you. The related lessons below will also give you more specific guidance. Before continuing with this lesson, you should have a good understanding of tritone substitution and its application to the 251 progression. We can now introduce the 3rd application of our chosen melody. This time we will play the melody built from the tritone. So for example, over a 251 in C Major the tritone of D would be Ab, and so we would play the melody of Ab-7 to Db7 over the 251 in C Major. Some of these melody notes will take us ‘outside’ of the basic harmony which adds interesting colours to our improvisations. 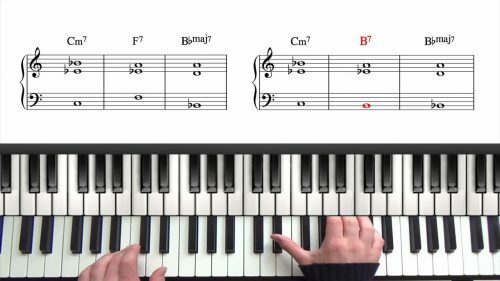 The first step is to practice this relationship around all 12 keys as outlined in the demonstrations in this tutorial. We will then demonstrate the application of tritone substitution melody to the tune "There Will Never Be Another You". Again we will demonstrate transposing the tune. This might seem like a lot of work to begin with, but with practice, it gets easier and easier. We are almost there! We now have three different ways to use and apply the melody. We are getting closer to the whole palette of entire 4 dominants or 25s that you can resolve to any tonic. In this lesson, we’re going to explore an important tritone relationship to help you quickly access altered dominant chord voicings in all keys. We explore various ways to add harmonic interest over dominant chords using tritones. We use the tunes ‘Body and Soul’ and ‘Misty’. In the related lessons above, we explored the tritone V7 chord. If you are not comfortable with this basic concept, spend some time studying the above lessons. In this lesson, we take this relationship a step further by introducing the associated ii-7 chord. 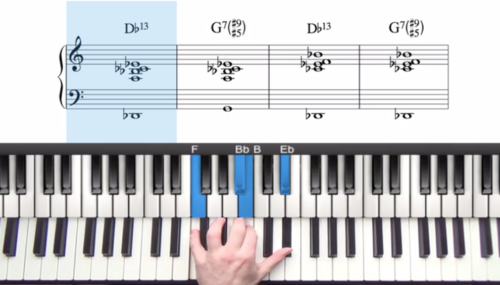 The first exercise is to learn and familiarise yourself with the tritone 25 in all 12 keys. For example, the tritone 25 of C Major would be Ab-7, Db7, to Cmaj7. You must be able to find these voicings in all 12 keys as per the demonstration covered in this lesson. Next, apply the tritone substitution melody over all of the 251 progressions. Finally, apply the tritone melody to every 251 in the tune "There Will Never Be Another You" and transpose the tune into as many different keys as possible.